The eWON Cosy (COmmunication made eaSY) is an industrial VPN router designed to offer easy and fully secure remote access, across the Internet, to machines and installations on customer sites or in the field. With eWON Cosy, Machines Builders, OEMs and System Integrators can troubleshoot machines remotely without going on site, drastically reducing support costs. The eWON Flexy is the first industrial modular M2M router and data gateway designed for OEMs and system integrators. The flexibility allows to link remote devices in an environment where communication technologies are constantly changing but also to communicate universally with the most varied field equipment, regardless of the protocol used. 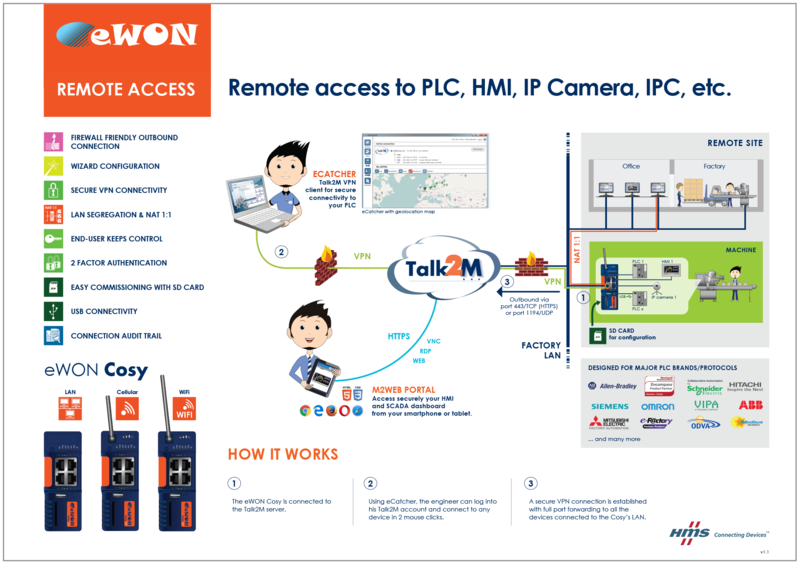 Easily connect any two industrial networks or PLC systems in just minutes. Connect. Configure. Done!